If you believe you see someone on the roadways that appears to be intoxicated, you can and should report it to the police. 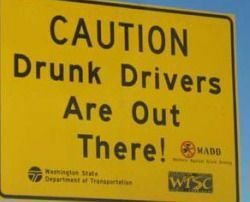 There are specific signs to look for when spotting a drunk driver. Once you call the police, they will handle it from there. Try and write down their license plate if you can. By reporting a drunk driver, you may safe the lives of many people on the road! Davis Law Group, P.S., reminds you to always use a taxi or have a designated driver if you have been drinking. Never drink and drive. It is not worth your life or someone else's. If you or someone you know has been seriously injured in an accident caused by an impaired driver, contact the drunk driving accident lawyers at Davis Law Group at (206) 727-4000 to schedule your free legal consultation.